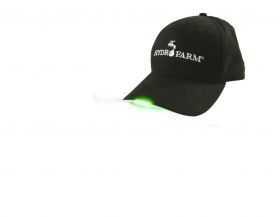 Enjoy hands-free bright lighting without losing a stitch of style when you wear the Hydrofarm embroidered logo LED cap. Five bright green LED lights won't interrupt plants' natural cycle and the cap's white brim contrast stitching helps you stand out during the daytime. This essential headgear features a moldable brim, adjustable hook-and-loop back closure, and 100% cotton material. In their default off position, the LED lights are almost undetectable. To operate the cap, slide the battery box out from its resting place in the cloth underside and turn to the on position. Push the sewn-in button on the underside of the capÂ?s brim and youÂ?re good to glow. The cap's battery is designed to last for long-term wear and is quickly replaceable with two CR2032 lithium cell batteries. Note: Due to the battery placement, this cap must be delicately hand washed.